A week after winning an exhibition against Team USA, 7-5 on the road, Miami beat Maine by the same score in its first regular season road game of the season on Friday. The odds of winning back-to-back road games by that score are pretty long, but it gets weirder. – Grant Hutton had never scored multiple goals in a game prior to last week. He netted two vs. the USNDT and two vs. Maine. – Josh Melnick had never recorded three assists – or even three points – in a game. His line was 0-3-3 in both contests. – Got one better: The last time Miami and its opponent had both found the net at least three times in the second period? Oct. 17, 2009. The RedHawks outscored the U-18 squad, 4-3 in the middle stanza last week. On Friday both teams connected three times in that frame. And that wild game 5-5 road tie eight years ago to the date? Nope, it wasn’t against Maine, but it was at the closest Division I school to Orono – at New Hampshire, less than 200 miles away. Winning a road exhibition had to instill confidence in a team that had gone so long between victories. Traveling over 1,000 miles to beat a Division I team is way better. The freshmen have a win under their belt after an 0-2 start including a brutal ending to Game 2. The sophomores finally got back on the winning track after a seemingly eternal winless streak and the veterans needed the pick-me-up as well after a lack of success Miami’s past couple of seasons. 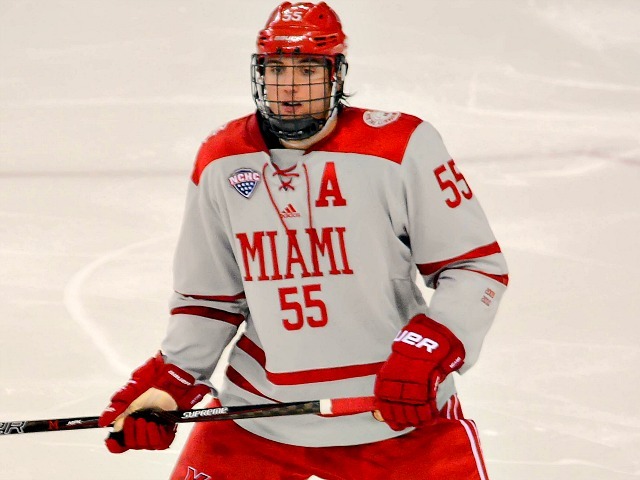 Miami’s Grant Hutton (photo by Cathy Lachmann/BoB). – Amazing how Grant Hutton went from a zero-goal freshman campaign to being one of the biggest defenseman scoring threats in recent history. He netted nine last season and has three in three games in 2017-18. That’s 12 in 39 games. The rest of the RedHawks entire D-corps has the same number in that span. Also, Hutton’s goals have all come on the power play, as he is in a nine-way tie for first in the NCAA in PPGs and among just three defensemen with three man-advantage tallies. – Love seeing Karch Bachman score. He seems to create a scoring chance every time he’s on the ice, and he was rewarded with ice/power play time on the Kiefer Sherwood line. Here’s hoping he gets more time on the man-advantage and the penalty kill, where he held his own vs. Providence. He’s got great speed, a great shot and an active stick that creates turnovers. He could break out this season. – We saw the Josh Melnick-Gordie Green chemistry in Plymouth, and that was on display again on the east coast. They were on the ice together for five of Miami’s goals, and one or the other was out there in each of the team’s seven markers. – Casey Gilling: 16-4 in the faceoff circle on Friday. This is a very welcome stat, as it’s an area in which the RedHawks have struggled in recent years. – On the flip side, Miami still has work to do defensively, as it has allowed 10 goals in six periods (albeit one of those games didn’t count), and it won’t score seven goals a game the rest of the season. Ryan Larkin faced 25 shots and allowed five goals last night, and his save percentage is just .857 thus far. His defense needs to help him see fewer high-quality chances, and he needs to stop more of the ones he does face. Posted on October 21, 2017, in 2017-18 and tagged 2017-18 miami redhawks, casey gilling, gordie green, grant hutton, josh melnick, karch bachman, NCHC, redhawks analysis. Bookmark the permalink. Leave a comment.